Seemed Like a Good Movie Replica, But All Our Hopes Were Shanghaied! One of the movies listed in our Quick List of Stonehenge Movies post is the 2003 movie Shanghai Knights. The Stonehenge above is seen in the movie for a minute or so. Have a look: not too bad, right? Even the shapes of the stones are good. 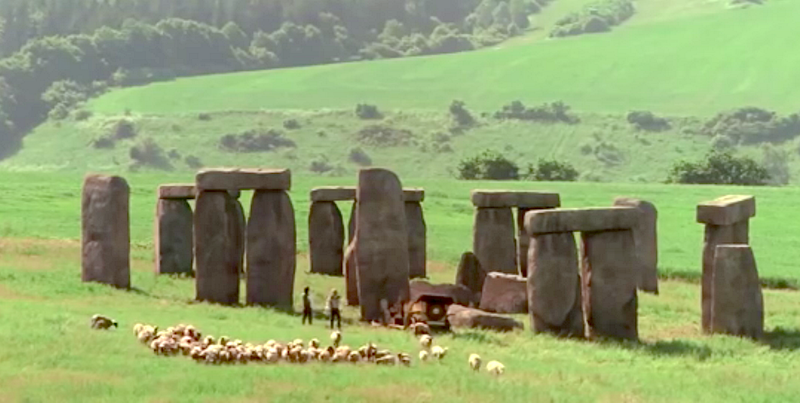 At last, an American movie replica that actually looks like Stonehenge. It even has the sheeps! But then we sat down and looked at it for a while. There’s something funny about those sheep. They should be bigger because they’re closer but instead they seem to be about the size of chickens when compared to the people. Unless there’s a whole Wiltshire breed of mini-sheep that we never heard of, that’s wrong. When we went on to examine the stones, the closer we looked, the more suspicious they seemed. Forget that it’s a series of trilithons instead of a stone circle. That’s such a common rookie error that it’s hardly worth mentioning. Before we say what we saw, take a moment and have a look for yourself at the photo at the top. See anything fishy? Here’s what we realised upon close study: that there are only two trilithons there, both repeated with small changes so you don’t notice. What does that mean? It means the Shanghai Knights Stonehenge replica never existed except as pixels. It is, disappointingly, merely a virtual henge. On the second view, the photo just above, it’s less obvious at first, but upon closer examination, it’s clear that it has been heavily retouched, with the bottoms of the stones particularly hazy. We’re not shocked. After all, building a whole Stonehenge out in a field for a short scene in which the characters never actually interact with the stones would be a lot more trouble and expense, and, frankly, more environmental damage than it’s worth. Still, it stands as a sad reminder that as computer graphics improve, we aren’t likely to see many real Stonehenges built for movies anymore. *sad Clonehenge face* It heralds the end of an era. It must be American humour, because if it’s funny, we don’t get it. Maybe the humour is virtual, to match the henge! We haven’t wished our readers a Happy New Year for 2014, so we do so now. May this be your best year yet. Remember, building a Stonehenge replica is good luck! Maybe that’s why Shanghai Knights didn’t turn out to be a very good movie. By refusing to build a real henge, they invoked an ancient Clonehenge curse! So build yourself a Stonehenge, and until next time, friends, happy henging!